The soak test invites that went out earlier in the week for owners of the XOOM 4G LTE on Verizon were indeed because of an imminent Ice Cream Sandwich launch. Big Red posted the support docs for the update today which is always a good sign that it will rollout within the next week or so. The build is exactly the same as what the Galaxy Nexus is receiving – Android 4.0.4 IMM76K. 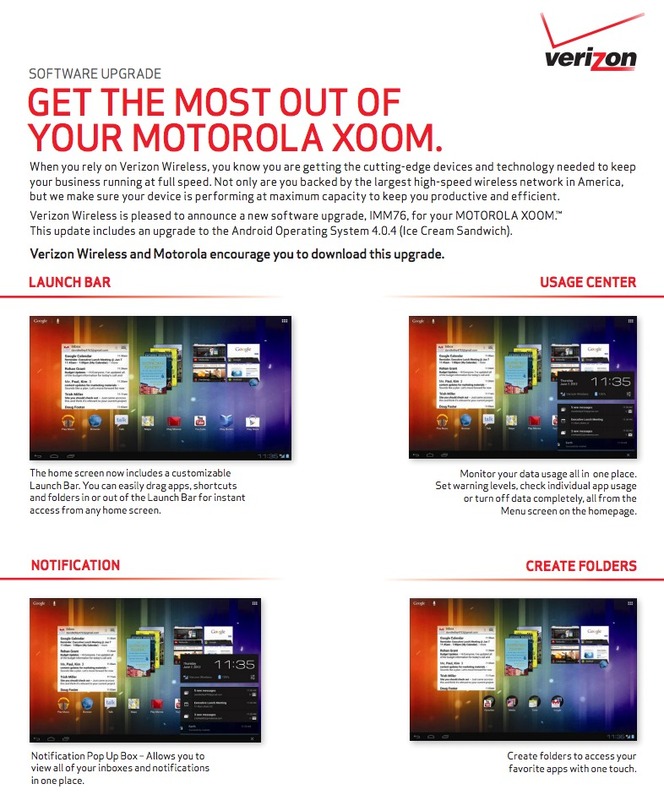 As you can see from the screenshot up top, Verizon wants you to know that ICS adds a bunch of new goodies (Folders, better notification management, etc.) that were not a part of Honeycomb. And not only will the XOOM now enjoy these new ICS features, but it appears as if device stability, network connectivity, and bug squashing were also a major focus with this update. The full changelog is below. The update is around 107MB in size. More info. Friday Poll: Favorite New Android Apps of the Last Month? Google Holding Maps Event Next Week to Show Off "Upcoming Features"